One thing I learned after moving to North Carolina from California is that bridal sessions are a big deal in the south! I really had no idea that it was a "thing" until I started to steadily book clients here. I can honestly say that I LOVE bridal portrait sessions! Sure, it's tough keeping the photos a secret and under wraps until after the wedding, but it's so fun getting to spend a few hours with my bride, laughing, chatting and playing dress up! I mean, isn't that the stuff girls' dreams are made of?! We shot Brooke's bridal session around 11am in downtown Jacksonville, NC at the Pelletier House. This is a popular location for Jacksonville NC Photographers because it's so quaint, picturesque and charming! If you've never researched the Pelletier House, and Jacksonville, you should (check it out HERE)! I just love knowing the history of where I live! 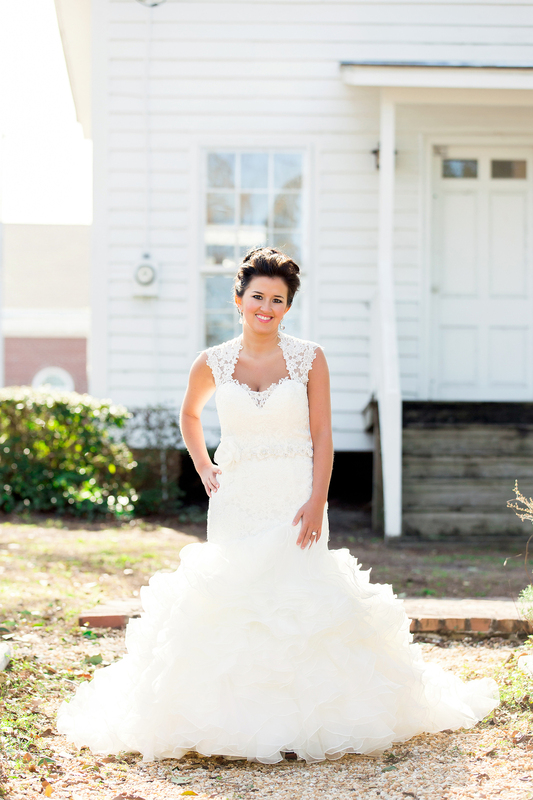 Brooke's dress from Savvi Formalwear in Raleigh is a show-stopper, featuring a lace bodice through the hips and a flared skirt full of ruffles. It's so feminine and glamorous-- just what you'd expect from a David Tutera for Mon Cheri gown! At the end of the session we pulled Brooke's hair down and I love that we were able to get two very different looks in the same shoot! Stay tuned for an upcoming blog post featuring Brooke and Christian's Jacksonville Country Club wedding!